Was last night amazing or what?!! It was as if the loons really wanted to say 'Goodbye' to you! They called over and over and over. It is the most calling that I have heard since the night I took the egg off the nest and they called back and forth to another pair of loons before they even knew the egg was gone. I could not believe how long and how often they called. It was bittersweet for all of us for this adventure this year to come to an end. Again let me tell you that I will periodically post an update for you. They will probably be few and far between because without chicks the loons will be out and about more. But I will try to update you once in a while. Tonight I took in the swimming raft and the buoys and moved the nest closer to shore. So now boats and fishermen do not have to worry about it. I haven't taken the nest up to shore yet nor taken all the equipment apart. But I will soon...I am gone for the next couple days so it will have to wait until after that. It gave me a chance to have a closer look at the nest for the first time since I put it out over two months ago. Can it really be that long ago?! There are several of the willow branches near the camera and microphone wires that definitely had been gnawed. You will remember that I was VERY concerned that the muskrat would gnaw through the cables and shut everything down. There was no sign that he had gnawed on the wires but he definitely had gnawed on the branches! And it was only an inch or two away from the cables....MUCH too close for comfort! I also tried to see what he was so intent on eating night after night when the loon would reach out and poke him. There was no creeping Charlie, green or dry, left in that area. I still cannot believe that he was intent on eating creeping Charlie but it may be. The other possibility is that I had put a cattail root over in that general area. It seem more likely that that is what attracted him but I am not sure. Also, the bowl of the nest was surprisingly shallow. More shallow than what I have usually seen. So it is no wonder she bumped the egg out of the nest twice. And I have never seen that before. I have to wonder what effect the MANIC nest-building played in that. When she was just THROWING material up on the nest! With the eggs already in the nest there was not the opportunity to use her feet to deepen the bowl like they would normally do. Once again, behavior that I have not seen before. I keep asking myself if this was a new and inexperienced pair of loons just learning everything for the first time. She really had taken almost all the vegetation she could get loose from around the iris and daylilies. They were left high and dry! It is amazing that they even survived. She had even gotten one small daylily bulb up INTO the nest where it was growing! The side of the nest facing out to the lake was especially low and I think that contributed to the egg ending up in the lake. I received report from the DNR about the eggs with pictures of the eggs and the X-ray. I thought you might like to see them so I tried to upload them here but could not. So I sent them to MN Bound and have asked them to post them so that you can see them. "Hi, Larry. 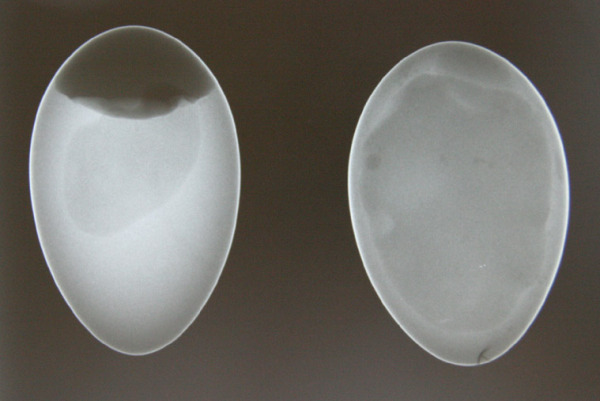 I have attached a photo of the X-rays of the two loon eggs. One appears to be infertile from the outset, with no air sac. The other one on the left has an air sac and a dark area under the air sac that could be the yolk-or an embryo that died early in development. I will find out this week when I blow the eggs. I have also included photos of the eggs for you. Best wishes, "
So once again it confirms that no matter how long we would have waited, the eggs would not have hatched. So I think it was the right thing to do to remove them so that the loons could get on with their lives. We had also talked about doing lead and mercury testing but a biologist said it would not show much reliable information because of the way the body handles lead and mercury. So now we work on trying to identify loons that can be part of the satellite tracking project. This has the potential for adding major knowledge about loons. And especially about those loons that may go to the Gulf of Mexico this fall and have to deal with the after effects of the oil spill. VERY little is known about loons on their wintering grounds. Almost no studies have been done. So this will hopefully add even some basic information. And then you add the challenge of the oil spill and knowing what the effect of that is, this could be some very valuable information for generations to come. If any of you know of lakes that have loons with chicks from this year, there is still time to send the information to LoonCam@yahoo.com to have them considered for inclusion in this study. Let me once again say how much I appreciate you!! All of you have been just amazing. Your knowledge that you already have about loons is impressive. And your desire to learn even more about these wonderful birds is encouraging. Your kind comments about the LoonCam and my blog have been humbling. So THANK YOU more than words can tell!